Brooklyn is such a big borough – NYC’s 2nd largest and most populous – that I sometimes feel bad for not exploring more. On Saturday, I saw friends and checked out new-to-me places without ever leaving BK. I loved it! 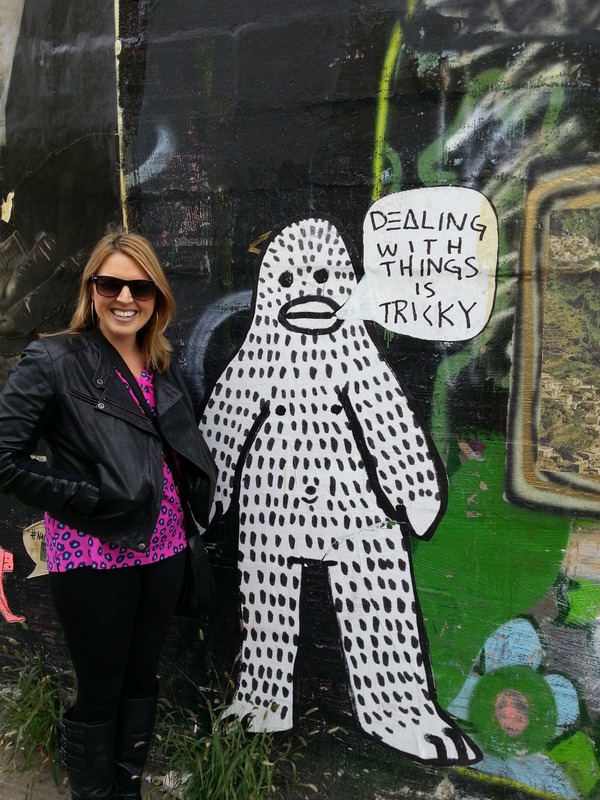 First I met up with my new friend Sarah in Bushwick. We had brunch at Roberta’s and then walked – and walked – to the Jonathan Adler warehouse sale. Brunch was terrific. We started by sharing a sticky bun. In retrospect, I recommend getting your own. There’s a terrific hint of salt that balances the sweet. 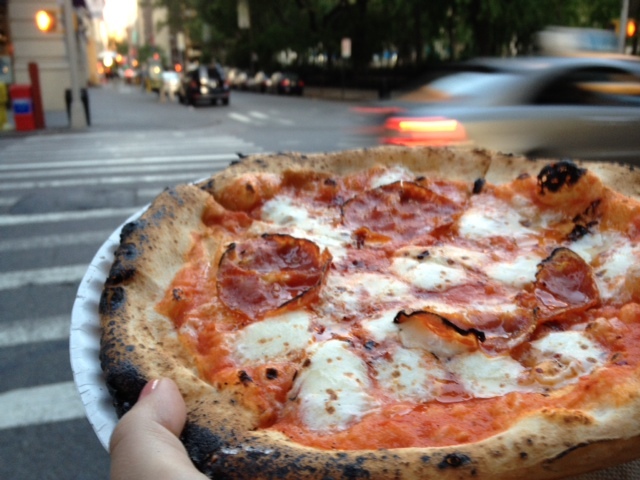 I could eat a dozen in one sitting so I’m glad Roberta’s isn’t within walking distance of my apartment! Then we shared a delicious bacon, egg and cheese sandwich on a potato roll and the Bee Sting pizza. Again, Roberta’s nailed the balance. For the pizza, the spice of chili flakes and sopressata are offset by a drizzle of honey. 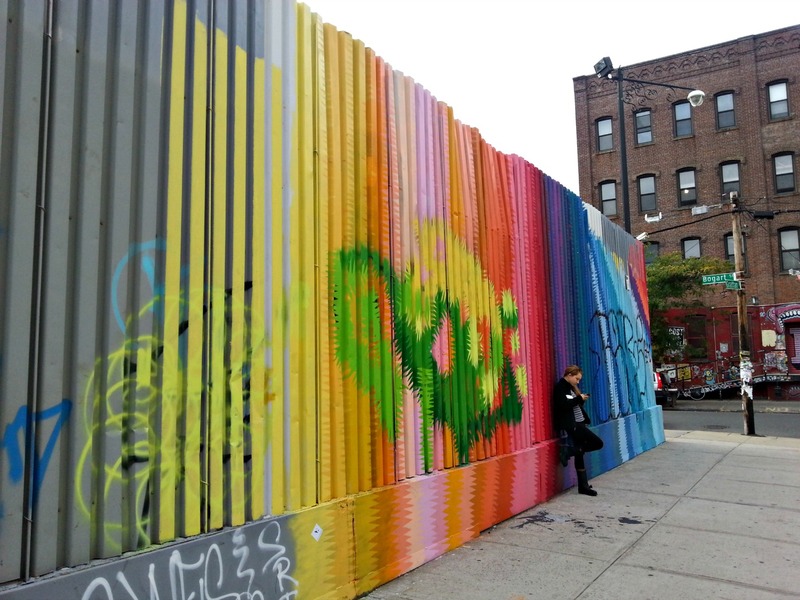 We then took a walk from one part of Bushwick to the other. It was a good way to work off some of our brunch and also my way of making up for spending no time in this neighborhood in spite of two years living nearby. We stopped at a store or two and then browsed the JA warehouse sale but didn’t make any purchases. Later, after my Bushwick adventure, I met my friend Katie at Bar Below Rye in Williamsburg for Manhattans and somehow, more food. The drunken grilled cheese sandwich is fantastic. I enjoyed my one-borough Saturday so much. How was your weekend? This entry was posted in Life stories and tagged bee sting pizza, brooklyn, brunch, Bushwick, drink, food, friends, Jonathan Adler, manhattan, nyc, Roberta's, Rye, shopping on October 21, 2013 by onechicklette. How was my weekend? Full of laundry, thank you! Your adventures looked amazing. Maybe because I’m hungry. Maybe because I think it’s really neat to have undiscovered territory so close to home. Undiscovered territory with yummy food is even better! You’re right: I AM lucky! I need to be better about exploring. This sounds like a perfect day. The pizza made me drool a little, and I’m reading this before breakfast.